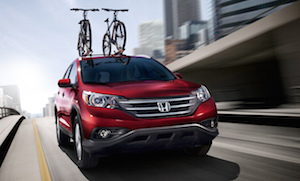 Are you searching for the lowest price on a used Honda CR-V in Marietta? If so browse our online inventory to see used Honda CR-V bargains currently available. Our used car and truck inventory offers a variety of pre-owned vehicles from many manufacturers. So we probably have exactly what you are looking for at an unbeatable price. Our used Honda inventory includes many pre-owned SUVs that have been thouroughly inspected and meet our exacting standards for appearance, reliability and safety. These vehicles are always offered at deep dealer discounts and our prices are some of the best you will find in the Marietta area. For our very best pricing, check our special offers page for bargains on used Honda CR-Vs in stock now. We offer many used car financing options. Even if your credit is less than perfect we can help you buy a used SUV with affordable payments. Our auto finance team can also help you find our lowest price on a used Honda CR-V in the Marietta, GA area. So why not stop by and take a test drive soon?